Blog to End the Occupation: Victory: LGBTQ Student conference withdraws conference from Israel! Victory: LGBTQ Student conference withdraws conference from Israel! Following successful campaigning by Palestinian queer groups such as alQaws for Sexual & Gender Diversity in Palestinian Society, Aswat -- Palestinian Gay Women, and Palestinian Queers for BDS, the international lesbian, gay, bisexual, transgender and queer youth and student umbrella organization IGLYO has withdrawn their annual conference from Israel, in line with the Palestinian call for boycott, divestment, and sanctions (BDS). Palestinian queer groups welcome the decision by the board of IGLYO to withdraw their annual General Assembly conference from Tel Aviv, Israel. 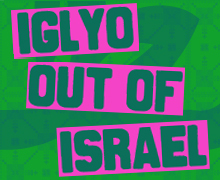 Since June 1st, a campaign to get 'IGLYO Out of Israel' was launched by Palestinian Queer Groups to protest the organization's decision to hold its General Assembly in Tel Aviv, and accept funding from the Israeli government, followed by a call to boycott the conference after IGLYO declined to change its location. We take this opportunity to salute IGLYO Member and Associate Organizations who took a principled and moral stance in support of our rights and headed our calls, including NUS-LGBTQ, Kaos-GL and Pembe Hayat from Turkey; BelonG To, the Ireland LGBT youth organization; and Helem -- Lebanese Protection for LQBTIQ, and IGLCN -- The International Gay and Lesbian Cultural Network. This can only be seen as a continuation of the beautiful spirit of global solidarity, dominant during the South African anti-apartheid struggle and ongoing in solidarity with the rights of the Palestinian people, and oppressed people everywhere. We also call on other member organizations, and IGLYO to fully respect the Palestinian civil society call for BDS until Israel ends its oppression of the Palestinian people. Palestinian Queer groups have launched this campaign in protest of the location's conference, and acceptance of funding from the Israeli government, which directly implicates IGLYO in Israel's occupation, colonization and apartheid, and Israeli efforts to 're-brand' Israel. Israeli policies and occupation do not distinguish between queer and straight. All Palestinians -- queer and straight -- must deal with the effects of Israel's apartheid system, illegal wall and colonial settlements, and military occupation. Furthermore, Palestinians in Gaza live under medieval and illegal siege, and the largest open-air prison in the world. Like all Palestinian citizens of Israel, queers are subject to institutionalized discrimination in all walks of life, and Palestinian refugees are denied their basic, UN-sanctioned right of return.